It hardly seems possible that it is 25 years since Nelson Mandela’s autobiography “A Long Walk To Freedom” was first published. The abomination that was apartheid may be no more than a vague concept to younger generations. But while major events and atrocities may have hit the headlines in this country, the daily grind of apartheid still had little meaning here apart from for the dedicated campaigners whose contribution to the anti-apartheid struggle is given special recognition in this exhibition. Co-produced by his grandson Nkosi Zweliveilile Mandela, there is much in this exhibition to recommend it to everyone with more than a passing interest in the history of South Africa and Nelson Mandela in particular. Zelda le Grange, his personal assistant for over 19 years, said to the initial gathering that it was important to get the history right for future generations. This exhibition provides a context for that history, giving an understanding of the great man’s heritage, the sense of morality he developed and the sacrifices he made to realise a South Africa with equality for all. 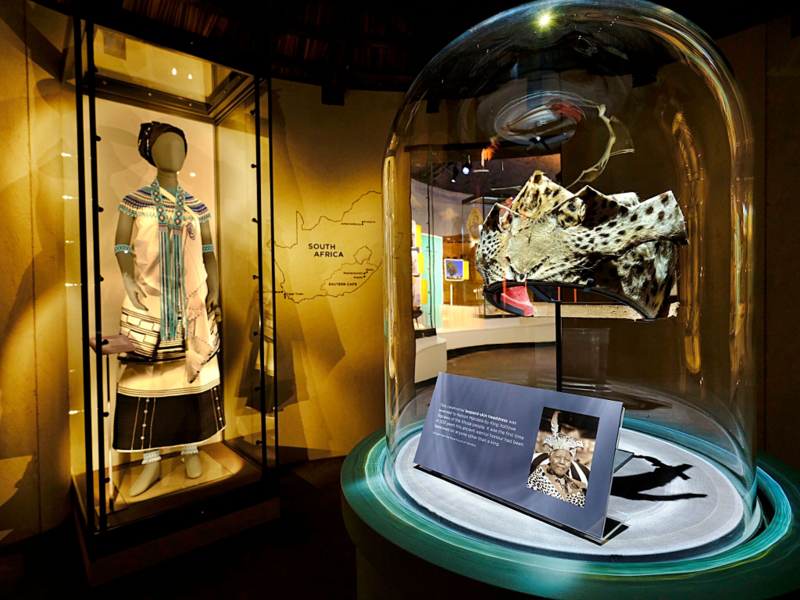 The exhibition itself takes a thematic approach, with Mandela’s early years presented within a replica of a traditional rondavel of the Transkei. The milestones of traditional Thembu culture which he experienced in his youth are outlined and illustrated. This leads on into a section entitled “The Struggle Is My Life” which also uses interactive media to enable the visitor to get a feel for the obscenity of apartheid and the consequences of struggle against it. No examination of Nelson Mandela’s life could avoid the impact of his 27 year incarceration on Robben Island and then Pellsmoor Prison. A number of artefacts have been donated by Christo Brand, his former prison warder who later became a lifelong friend. 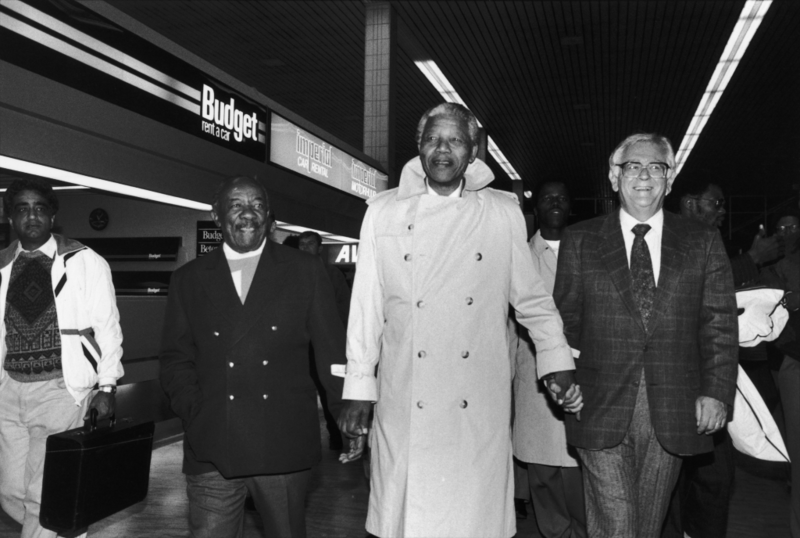 One of the extraordinary features of Nelson Mandela’s life was the absence of any bitterness expressed following his release from prison. But as the section entitled “Freedom?” makes clear, the struggle was far from over. Indeed, more lives were lost in the years 1993-94 than in the previous 30 years. In “Healing a Nation” we learn how the challenges of uniting a divided nation and dealing with the legacy of repression were dealt with, leading into “A Moment With Mandela” in which visitors see and hear the man himself expressing his hopes for future generations. Even for those who feel they know a great deal about Nelson Mandela and the times he lived in will discover nuggets that they had either forgotten or were completely unaware of. With a variety of artefacts, media presentations and interactive displays, there is much to keep an audience of varied ages engaged. It came as something of a surprise to discover how long had been spent within the exhibition and how unexpectedly moving the experience was. The exhibition is running until the 2nd June and tickets can be brought through Ticketmaster. Tickets are between £8 – £15. If you like this post you might also like my post about the Musical Theatre Quiz at The Other Palace. Mandela- The Official Exhibition is mounted in collaboration with the Royal House of Mandela and the Mvezo Development Trust. Further global dates are to be announced as part of a world – wide tour before the exhibition is permanently mounted in Mvezo, Mandela’s birthplace. The exhibition appreciates the support and involvement of several South African Heritage Partners including institutions and individuals who are contributing to the exhibition content. These Heritage Partners include: The Robben Island Museum, The Liliesleaf He ritage Site, Mqhekezweni – The Great Place, Christo Brand and Zelda la Grange A portion of the exhibition proceeds will be given to the Mvezo Development Trust to support economic development programmes in South Africa’s Eastern Cape.